Welcome to the website of The Oxted Players an amdram group performing plays and pantomimes at the Barn Theatre, Oxted since 1946. With three productions a year and four every other year, and also our Festival entries we are a very busy Society. If you are interested in becoming a member, please visit our membership page. For tickets for our productions & pantos, please visit our ticket page and for any more information or to get in touch, contact us. 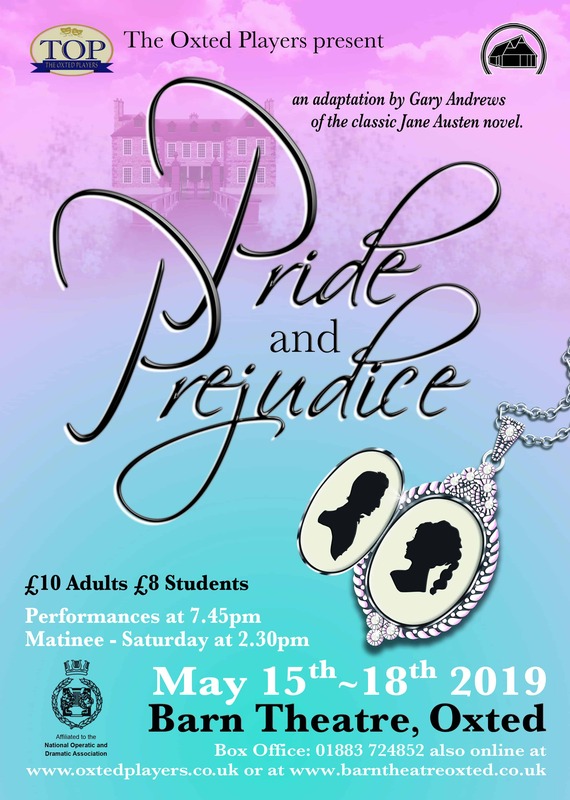 Our May production (15th to 18th May) is “Pride and Prejudice” an exciting adaptation by Gary Andrews of the classic Jane Austen novel to be directed by Peter Reed. A cast list can be found here. Set in the early 1800s, the story follows the fortunes and misfortunes of the Bennet family. Mr. Bennet of the Longbourn Estate has five daughters, but his property is entailed, meaning that none of the girls can inherit it. His wife has no fortune, so it is imperative that at least one of the girls marry well in order to support the others upon his death. The story charts in particular the emotional development of the second eldest daughter, Elizabeth, who learns the error of making hasty judgments and comes to appreciate the difference between the superficial and the essential. It also emphasises the importance of marrying for love, not simply for money, despite the social pressures to make a good (i.e. wealthy) match. Our Autumn production will be “The Safari Party” by Tim Firth directed by Peter Shore. A read through will be held on Sunday 28th April at 2.30 at the Barn Theatre Oxted. Auditions will initially be held on Thursday 23rd May at 7.30. Venue to be confirmed. A synopsis and cast list can be found here. Please contact us at secretary@oxtedplayers.co.uk for other information.